Huawei today unveiled the MediaPad 2 android tablet under its Honor brand. The Honor MediaPad 2 which packs an 8" HD display is powered by an octa-core Snapdragon 652 processor with an Adreno 305 GPU, there's also a generous 3GB of RAM which is enough to handle most tasks that you could possibly throw at this midrange tablet. The Honor MediaPad 2 also packs a decent 2MP/8MP front and back camera combo which is jist about fine for a tablet. 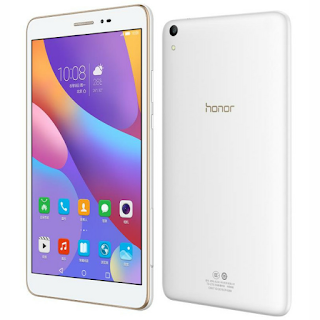 The Honor MediaPad 2 would come in two storage option, a 16GB and a 32GB which is expandable via a microSD card slot, in addition to a WiFi or 4G LTE version with voice calling. The Honor MediaPad 2 would run Android Marshmallow with Hauwei's EMUI skin out of the box. The Honor MediaPad 2 comes with the usual WiFi, Bluetooth, GPS connectivity options and would be powered by a 4800mAh battery. The Honor MediaPad 2 would come in an option of either Gold or White colours. The pricing for the Honor Pad 2 at $148 ( 999 Yuan or 9, 890 Rupees) for the base 16GB WiFi only version, $192 (1299 Yuan or 12,855 Rupees) and $222 (1499 Yuan or 14,835 Rupees) for the 32GB LTE model. The Honor MediaPad 2 would be available for preorders starting from the 19yh of October with sales commencing on the 25th of October.